Appearances are deceiving in San Francisco: the distance between two points on a map, for instance; or that funny looking nun with a mustache. It’s true of restaurants as well. Elegant facades can belie inferior eats. And gritty basement boîtes often bubble up with tantalizing flavors. File Jasper’s Corner Tap & Kitchen under the latter. In the harsh light of day the restaurant’s visual charms are all but washed out – like one of those Tenderloin tender traps I’d normally studiously avoid. Yet I’d heard there were interesting experiments going on behind the bar – as well as in the kitchen – and felt it my duty to check things out. 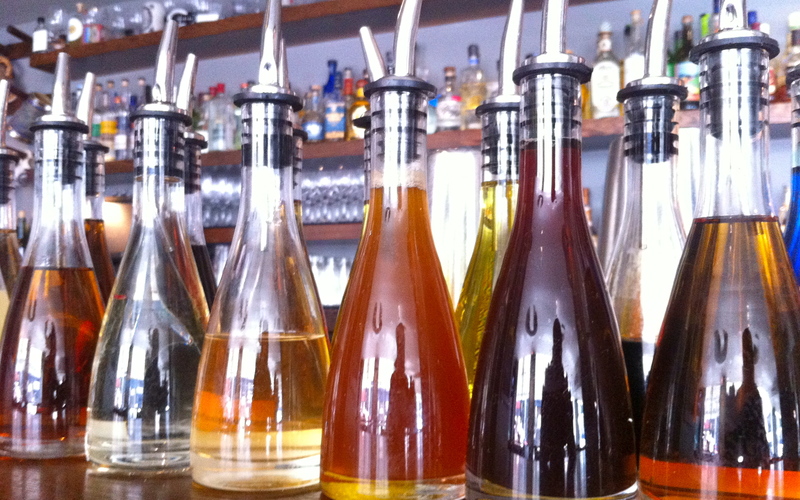 I’m glad I did because Jasper’s – despite an anodyne sense of design – is no ordinary “corner kitchen,” but the latest in a wave of cocktail bars and speakeasies that are marking the City by the Bay as a town that takes its tipple seriously. I start with a classic, the Negroni, which Jasper’s happens to keep on tap. 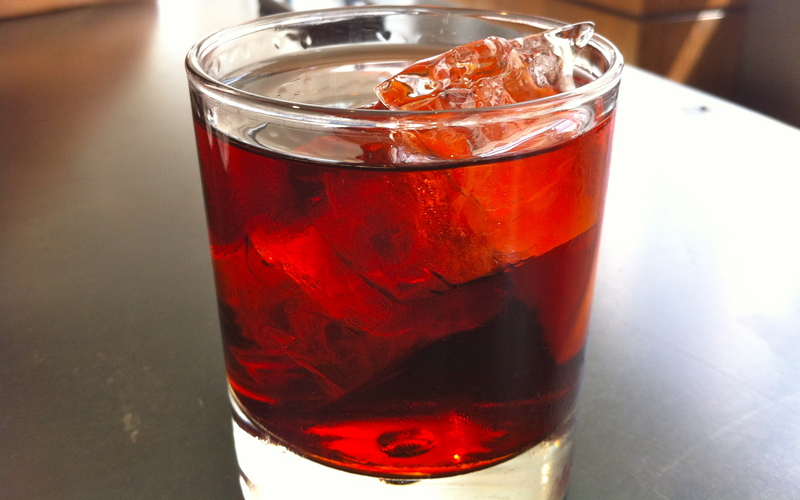 You read that right: gin, Campari, and sweet vermouth in an ideal 1:1:1 ratio on tap. Frisco apparently has a penchant for lip-smacking aperitifs; the Negroni proved so popular that a second herbaceous cocktail recently joined the tap: a mix of gin, sweet vermouth, and fernet dubbed The Hanky Panky. Mixologist Kevin Diedrich is the mastermind behind the clever idea, as well as a dozen-plus seasonal cocktails, like Rhubarb Mule (a mix of bourbon, orgeat, rhubarb syrup, ginger ale and bitters) and a Wiessen Sour (bourbon, lemonade, orange marmalade, house-made bitters, and white beer). Plus, there’s also what might very well be the perfect summer concoction: house-bottled carbonated Pimm’s cup, muddled with strawberries and mint. Even better, there’s the kitchen in Jasper’s Corner Tap & Kitchen, which under chef Adam Carpenter has it’s own seasonal sensibility. 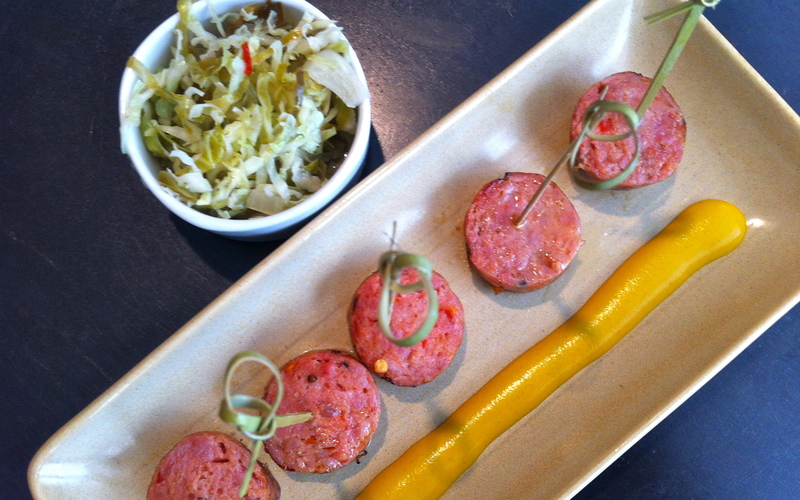 If this weren’t laid-back San Francisco, you might even call it a gastro-pub. (But it is, so you won’t) Even so, the constantly evolving menu has been crafted to complement the strongest stout to the most subtle ale. 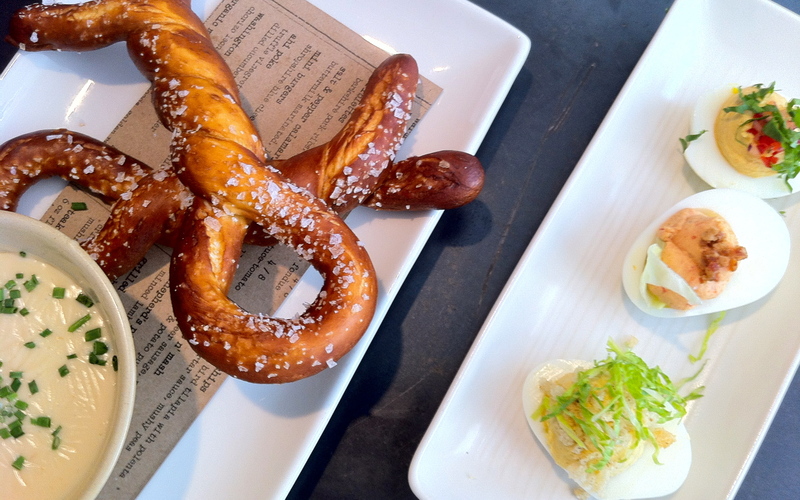 I order a handful of small plates to see if works with various cocktails: salty Shishito peppers, a trio of deviled eggs, briny brussel sprout slaw and house-made sausage bites, and a warm soft pretzel with smoked gouda fondue. It does. Then I squirrel away the fondue, knowing it will be heaven for dipping with French fries. 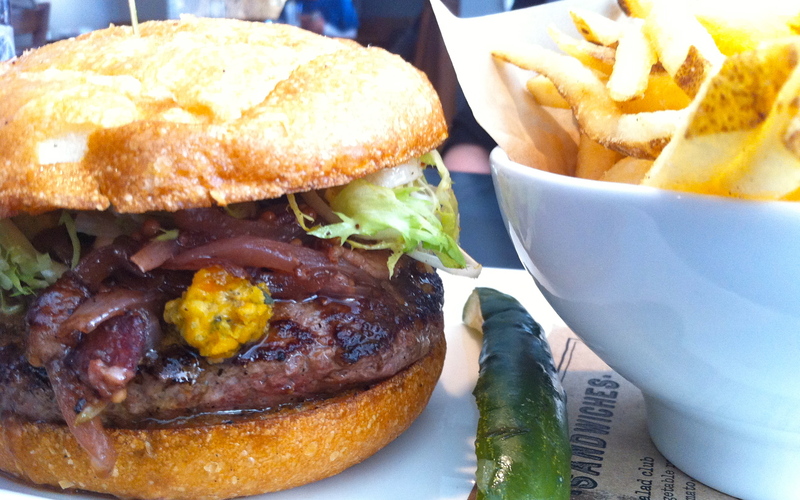 If you want to go “full gastro” The J Burger is a monument to the humble pub burger of yore; griddled Lucky Dog Ranch beef, English blue cheese, bacon onion marmalade, and frisee salad on a baguette bun. You won’t finish it, but apparently few people do. A lighter alternative is an equally flavorful filet of Scotch salmon atop a bed of organic black lentils. Sated, sedated, and just a little bit intoxicated, I’ve no room for coffee, let alone dessert. Before I head to the door GM Matthew Meidinger makes a point to tell me how at first people came to Jasper’s for Diedrich’s drinks. Then I finish the thought for him: now they stay for the food, too.